Astronomers have found the signature of Earth-eating stars. A team of astronomers say they've developed a way to detect planet-eating stars using their chemical signature. The new method could bolster the search for alien planets outside our solar system, the researchers say. 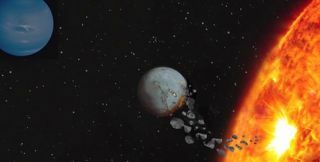 "With the right amount of pulling and tugging, a gas giant can easily force a rocky planet to plunge into the star," Mack said in a statement. "If enough rocky planets fall into the star, they will stamp it with a particular chemical signature that we can detect." Mack and colleagues looked at the binary pair of G-class dwarf stars dubbed HD 20781 and HD 20782, which were formed out of the same celestial dust cloud and now both host their own planets: one is circled closely by two Neptune-size planets; a single Jupiter-size planet orbits the other. Different elements absorb light in different ways. By looking at the wavelengths of light or spectra of a star, scientists can determine the abundance of certain elements it contains. Spectra from HD 20781 and HD 20782 showed that these stars, compared with sun, were high in refractory materials — building blocks for Earth-like rocky planets, such as aluminum, silicon, calcium and iron that have melting points higher than 1,200 degrees Fahrenheit (600 degrees Celsius). The researchers' calculations suggest the star with the Jupiter-sized planet would have swallowed the equivalent of 10 Earths. Meanwhile, the star with the two Neptune-sized planets likely consumed 20 Earths' worth of rocky material. "When we find stars with similar chemical signatures, we will be able to conclude that their planetary systems must be very different from our own and that they most likely lack inner rocky planets," Mack said in a statement. "And when we find stars that lack these signatures, then they are good candidates for hosting planetary systems similar to our own." The results of the study were published May 7 in the Astrophysical Journal.